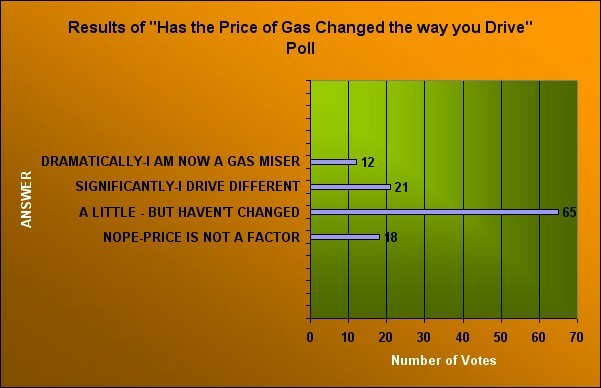 Poll Results: Has The Price of Gas Changed the way you Drive? A few weeks ago I asked the question, "What's the Price of Gas Doing to Your Driving Habits?" The answer, apparently not that much. More than 100 of you responded and the results were pretty telling. At least 70% of you suggested that you haven't changed your driving habits at all, while the other 30% now consider yourself gas misers. I truly would thought the results would reflect the exact opposite. Maybe the numbers showing the median income and net-worth of Porsche owners was more accurate than I thought. Gold and Tweed Covered Porsches…. Why?